A description of the twin turntable desk which was widely used throughout the BBC. It was late in 1955 that the BBC, having bought the Riverside Film Studios in Hammersmith, which were situated by the banks of the River Thames, some distance from the centre of Hammersmith, started to use the Recording Theatre there as a dubbing theatre. This theatre had previously been used as a scoring stage, and had excellent accoustics. RCA had used it to record music in stereo for some of the early CinemaScope films, feeding the stereo sound down landlines to RCA's own re-recording theatre in The Tower, Hammersmith. Riverside Studios had been acquired by the BBC in 1954 as there was a need for studio space and to allow the studios in Lime Grove to be taken out of service, one at a time, for upgrading to the latest equipment. The original film stages were being demolished round about us to make way for some modern tv studios using experimental lighting control systems, and because of all this building work we had to have a commentary booth constructed inside the auditorium, and completely isolated from the floor etc to keep down the bangs and crashes from outside being picked up by the narrator's microphone. This was "tested" by one of the P&ID (Planning amd Installation Dept) guys furiously rocking up and down on the floor the old conductor's rostrum which he called the "Dreadnought". Three TD/7 gram desks (giving six turntables) were installed alongside the RCA mixing console and on some documentaries I would end up with great piles of discs on top of them after a hectic session. Discs could have a shortened life when subjected to this treatment, and once I queried this with the Head of Film Recording, John Byers. His reply was "Well we'll just have to buy more discs"! A number of 50-minute documentaries were dubbed here, and we later discovered that they were subsequently being shown in Australian cinemas, Australia not having its own television service at that time. The dubbing mixer was Les Philips so his name was on the credits. One day at Riverside we had some film inserts to dub for one of the "Life With The Lyons" programmes. 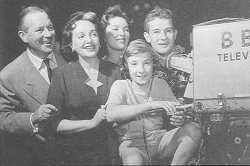 This was a situation comedy series in the mid-1950s starring Ben Lyon and his wife Bebe Daniels and their children. On this occasion their daughter was getting married soon and one of the shots in this film was a silhouette side shot of the daughter and her intended slowly coming together, in order to kiss. Well, having run the film before the artists had arrived, we "substituted" the sound of two trains slowly shunting, the bumpers coming together just as the two lovers touched. Boy, were they surprised! The development of direct disc recording is told in Edward Pawley's book BBC Engineering 1922-1972 from which an excerpt is given. Since the theatre had been built before the days of magnetic recording, to allow an immediate playback (albeit not synchronous) a 78rp disc recorder had been installed in a small room behind and looking into the theatre. It was made by the MSS company - and it worked! So we obtained a small supply of blank 12" acetate discs from the Recording Dept at Maida Vale, and I experimented, producing some "spoofs" of current programmes (in sound).